MSE Creative Consulting Blog: So, How Did That Forecast Work Out? Two days ago, I wrote about the upcoming winter storm and what I thought would be a straightforward forecast plus an aspect of the forecast that would be quite difficult. Thought you might like to see how it worked out. The dark blue represents moisture content of snow of 0.50 to .74 inches. The light blue is .75 to 1.0. You may recall that I wrote that the northern precipitation band was a straightforward forecast and that I was confident in it. The band along the Oklahoma border was so small that it was below our ability to place accurately and the probability of that aspect of the forecast being correct was "fair to poor." The color scheme of the maps is not the same. The light green equals 0.5 to .74". 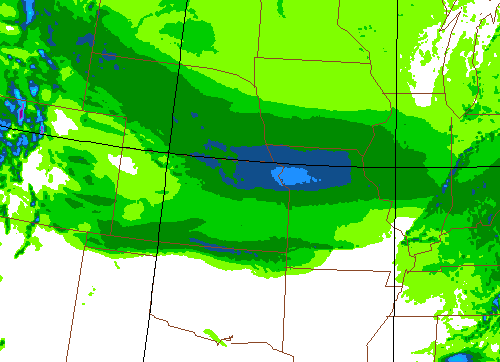 As expected, the northern system's forecast distribution of snow was very good. The rush hour in Kansas City yesterday was a "nightmare" with twenty minute commutes taking two hours. 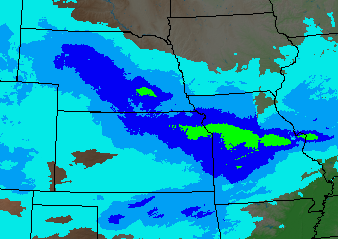 There were some parts of northern Missouri that received 12" of snow, so the heavy snow warnings were excellent. 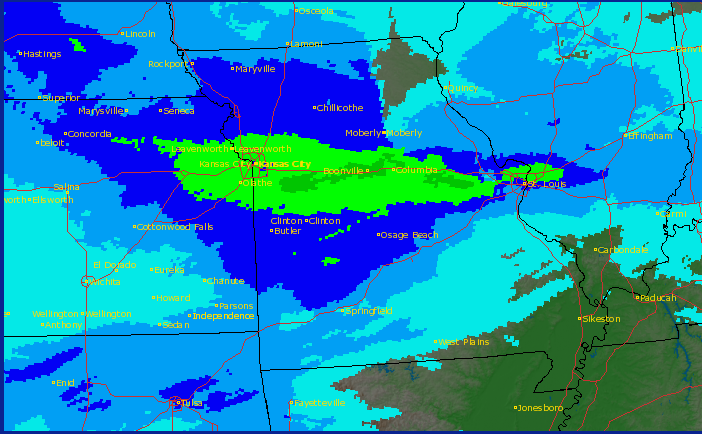 There was heavy snow in St. Louis that was not forecast in this first iteration but was forecast in the next computer model run. The second system along the Oklahoma - Kansas border was the mess I thought it would be. The moisture from the Gulf of Mexico got into the system more slowly than originally expected so the precipitation started as freezing drizzle in many areas which ultimately cut the snow amounts in southern Kansas. Here in Wichita, instead of getting the "around 2 inches" we received freezing drizzle then about a 1/2 inch of snow. Because of slow advance of moisture into the low pressure system, parts of western Kansas received no moisture at all except for trace amounts of drizzle. In northern Oklahoma, amounts were heavier and more widespread than the initial forecast indicated. This, too, was caught in the updates and a winter storm warning was issued before the ice and snow started falling. I still think the correct assessment of the southern system forecast is "fair to poor" -- while there certainly was a winter storm, it didn't play out exactly as we thought. There is a silver lining: We knew that forecast was "low confidence" when it was issued while we knew the northern system was "high confidence." That information can be used by decision makers to improve the quality of their response. While still a long way from perfection, it is remarkable how far we have come in improving the forecasts and warnings of extreme weather in the last ten years. UPDATE: Noon Thursday, NOAA updated the actual precipitation data and here it is. The lightest darker green equals .75 to 1.0 inches of moisture content of snow, which translates to 8 to 12 inches of snowfall.